Chris Puplava at Financial Sense put together an excellent series of charts last week in Economic Indicators Show Recession As Early As Next Month. Puplava's prognosis that the "Global Economic Train Is Coming Off the Tracks". My commentary below pertains to one topic of Puplava's post, namely consumer sentiment. I will add to his commentary with additional charts and commentary of my own and from others. Today we were treated to the August reading for the University of Michigan Consumer Sentiment report which showed a reading of 54.9, the third worst reading in history and well below the median estimate of 62.0. This has been the case now for the past month in which economists have been way off the mark in terms of their estimates and reality. This often occurs at major tipping points (both bearish and bullish) as economists often extrapolate past results into the future and thus overshoot at economic peaks and undershoot at economic troughs. The string of overshoots in estimates from the ISM Manufacturing Index to GDP to consumer sentiment indicates we are yet at another economic inflection point in which the economy is rolling over. 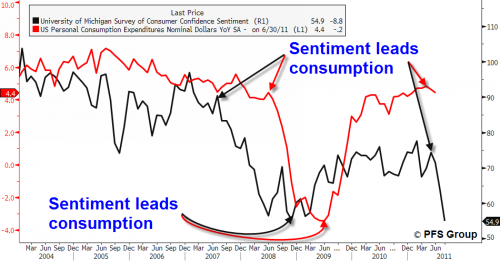 What is troubling about the Michigan Consumer Sentiment reading is that it often leads turns in consumption trends. First consumer’s moods change and then spending patterns follow suit. The sharp drop in consumer sentiment suggests consumers are likely to pullback sharply on spending in the months ahead. Puplava's call for a consumer spending pullback piqued my interest because Consumer Metrics Institute's Contraction Watch online spending chart suggests something different. Consumer Metrics tracks online internet sales in the US, where the transactions are conducted in English. 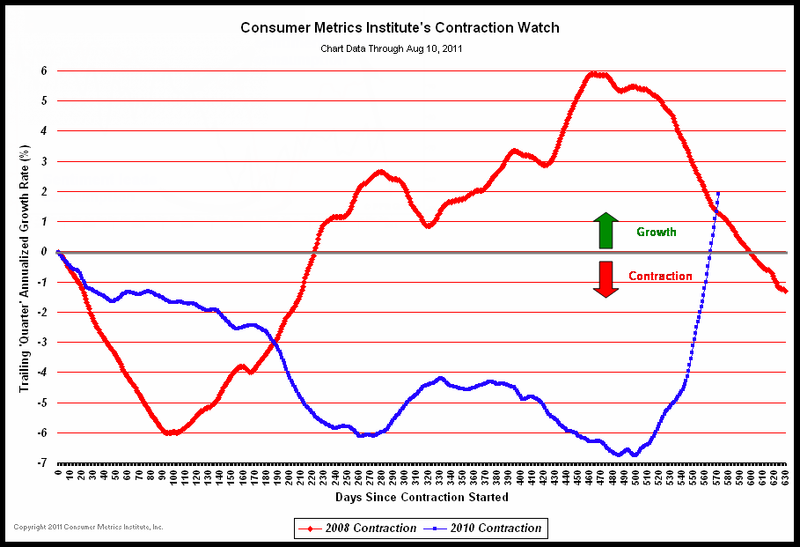 Here is Consumer Metrics latest consumer spending "Contraction Watch" chart. The chart is confusing in that there is no blue-red crossover. The red line represents days since the 2008 contraction and the blue line is days since a 2010 contraction. 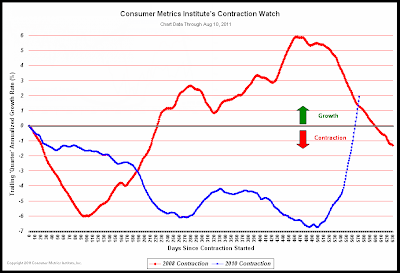 The word "contraction" is in reference to Consumer Metrics' proprietary indicator of online sales. The 2010 contraction started in January 2010. Interestingly the 2008 contraction did not start until May. Note that the first time in approximately 560 days, consumer spending as tracked by Consumer Metrics crossed the zero line. It is very important to remember that our Daily Growth Index (and its precursor Weighted Composite Index) measure year-over-year changes in consumer demand for on-line discretionary durable goods. In other words, the indexes measure the slope of the demand curve, not the actual demand itself. 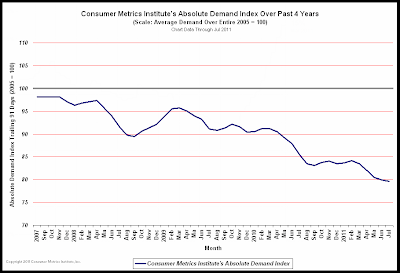 When the indexes first cross into neutral territory (a reading of 0 for the Daily Growth Index and 100 for the Weighted Composite Index) it only means that the actual "absolute" on-line demand is no longer getting worse -- i.e., it has just reached rock bottom. The following paragraph from Consumer Metrics Methodology discloses potential sampling error problems. We are monitoring only U.S. consumers who are transacting in English on the internet. This causes demographic sampling biases that means that our consumers may be educationally, economically and socially skewed relative to the entire U.S. population and economy. We are tracking only discretionary durable goods ordered, purchased, or financed via the internet. This means that we are not capturing many significant sources of spending: groceries, non-discretionary medical services, some utilities, gasoline, non-reserved entertainment or dining, items ordered by phone or mail, bills paid by conventional check, etc. That being said, we are convinced that the portion of the consumer economy we monitor (major discretionary durable goods) represents the most volatile and stimulating component of the entire economy, and that our internet-only sample of that component is a sufficient proxy for the whole. We use GDP quarterly growth tables since 1947 to gain perspective on how the economy is performing, i.e., how 'normal' it is. We're not very convinced that the over sixty years represented in the tables is truly representative of the U.S. economy over the past twenty years. The potential biggest flaw is the first bullet point regarding internet sales and how sales are captured. ComScore released its Q2 2011 U.S. retail e-commerce sales estimates, which showed that online retail spending reached $37.5 billion for the quarter, up 14 percent versus year ago. This growth rate represented the seventh consecutive quarter of positive year-over-year growth and third consecutive quarter of double-digit growth rates. "Consumers are continuing to shift to the online channel, with almost $1 in every $10 of discretionary spending now occurring online. E-commerce’s benefits of convenience and lower prices continue to be the drivers of the shift. At the same time, we are constantly reminded of an overall macroeconomic situation that is not indicative of a strong recovery. With economic growth remaining soft, the unemployment rate stubbornly high and financial markets in turmoil, consumers are less optimistic today than they have been in preceding quarters, which raises concerns for the future. We believe the third quarter will be an important indicator of which direction this economy is really headed and what that will mean for consumer spending." I had a discussion with Rick Davis at Consumer Metrics over the concern that rising online sales in general accounts for some of the rise in Consumer Metrics' indicator. However, Davis replied that Consumer Metrics adjusts for the rising percentage of sales coming from the internet. That alleviates one concern assuming the adjustment is accurate. However, there are other issues. The discussion revealed that Consumer Metrics tracks online sales by IP address in a per-capita basis. IP addresses will change when someone buys a new computer. Families can share computers. Some heavily used sites, primarily businesses with a fixed IP address and hundreds of employees all shopping online during lunch breaks (if not regular hours), might skew interpretations. In response to questions about IP Addresses, Rick Davis replied via Email. 1) If consumers consistently share the same computers or IP addresses (a family) we end up with a "profile" of a collective shopper. As long as the shoppers within that profile are the same over time, the fact that we have a "family" profile instead of an "individual" profile is statistically irrelevant. However consumers shopping at work can represent an out-sized family, and for some large corporations a single IP address can end up representing thousands of workers in dozens of locations. Not to mention publicly shared IP addresses for hotels or coffee shops. For that reason (and several others) we toss out the 10% of the IP addresses with the heaviest traffic. 2) The second problem that you listed could end up improving our data. In fact, occasionally the changing IP addresses assigned by the broadband carriers is the limiting factor in the span of time that we can do our "same shopper metrics," and one of the major reasons we start out with year-over-year data. Longer term use of unchanging IP addresses would be a major help. Consumer Metrics discards the top 10% of IP addresses. Is that valid? I do not know. Is per-capita capture the best way of looking at things? I do not know. Are Consumer Metrics' adjustment factors including demographics correct? Again, I do not know. There are a lot of variables and adjustments in play and maybe they cancel each other out or maybe they don't. Let's look at Consumer Metrics data another way. That chart conveys a completely different impression than the first chart. This is why in reference to the first chart Davis cautioned "The indexes measure the slope of the demand curve, not the actual demand itself." On Friday, Reuters and the University of Michigan released the preliminary consumer sentiment index for August. This showed a sharp decline in sentiment to 54.9, the lowest level in 30 years (see graph below). My reaction was the decline in sentiment was related to the heavy coverage of the debt ceiling debate, and not due to the usual suspects: gasoline prices or a weakening labor market. Of course consumer sentiment was already low because of high gasoline prices and a weak labor market, but gasoline prices are now falling and initial weekly unemployment claims have declined recently (the key for sentiment is that neither appears to be getting worse rapidly). My feeling is the debt ceiling decline - assuming the decline was due to the insanity in D.C. - is most similar to the 1987 stock market crash (that scared everyone, but had little impact on the economy) and to Hurricane Katrina (although Katrina led to higher oil prices and a direct impact on consumption in several gulf states). If I'm correct, then sentiment should bounce back fairly quickly - but only to an already low level. And the impact on consumption should be minimal. Of course sentiment could have declined because of other factors (weak labor market, European financial crisis, etc), and then sentiment will probably not bounce back quickly. So, which interpretation is correct? It is possible they all are or none of them are. I am happy they all publish their ideas for free, for everyone to review. Can they all be valid? Sure. Pulpava can be correct about a sharp pullback in spending even if consumer sentiment snaps back a bit from extremes. 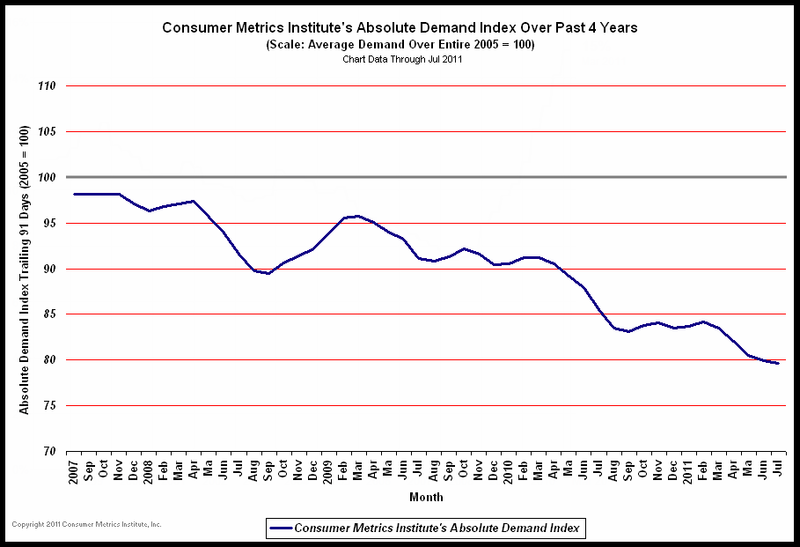 Consumer Metrics data can change at any time but the Absolute Demand chart looks pathetic now. Durable goods (notably appliances may simply be skirting along the bottom). In terms of effect on the economy, a pickup in new home sales is far more important than existing home sales. Davis does track housing but cannot distinguish between existing homes and new homes. Sentiment-wise I note a deterioration in Congressional approval ratings to a record low of 13% and a new all-time low approval rating of Obama at 26%. Please see Congressional Approval 13%;Theory of Elections and Overcoming Huge Political Bureaucracies; What the Hell Does it take to Get Real Change? for my thoughts on Congressional Approval Ratings. Yesterday, Gallup came out with a new poll that shows 26% Approve of Obama on the Economy. These are post-debt-ceiling polls. The debt-ceiling may have been increased, but on the political side, no one seems any happier about it. Given the weak data everywhere I look, coupled with increasingly sour sentiment on the economy and political leaders, it appears the US is headed for recession if not in one. Thus, I am inclined to agree with Puplava that the "Global Economic Train Is Coming Off the Tracks" regardless of near-term consumer spending patterns or online sales.